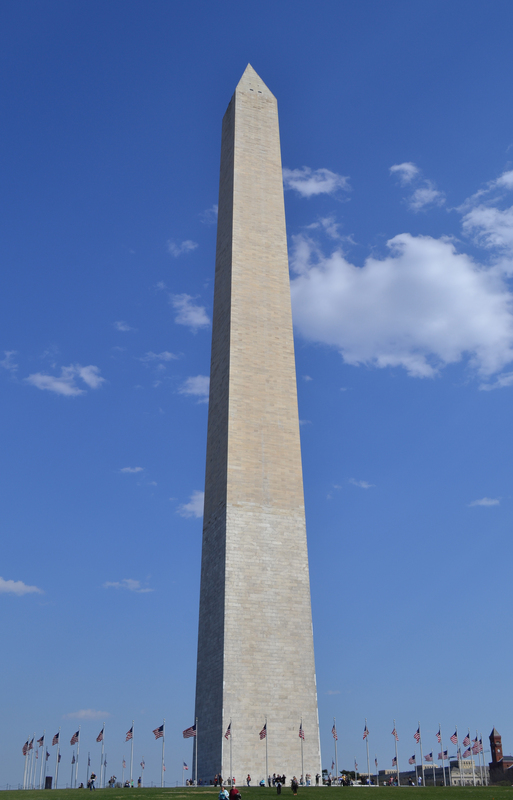 One sight we couldn’t miss in D.C. was the Washington Monument. Mostly because you can see it from almost any vantage point at the nation’s capitol. 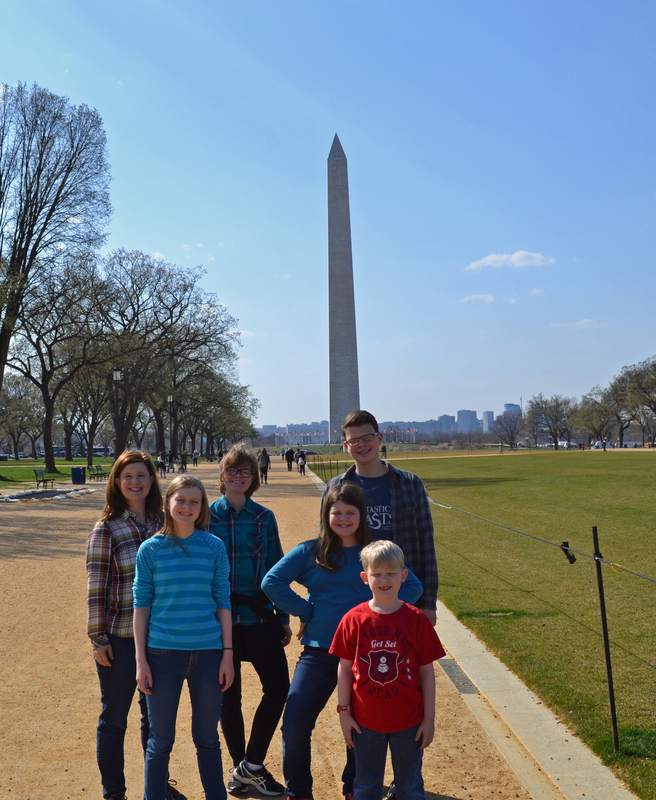 After we had seen as many of the Smithsonian Museums as we could squeeze in, we reserved a day for touring monuments. The remaining posts from D.C. are all from one day. We walked seven miles on that day. 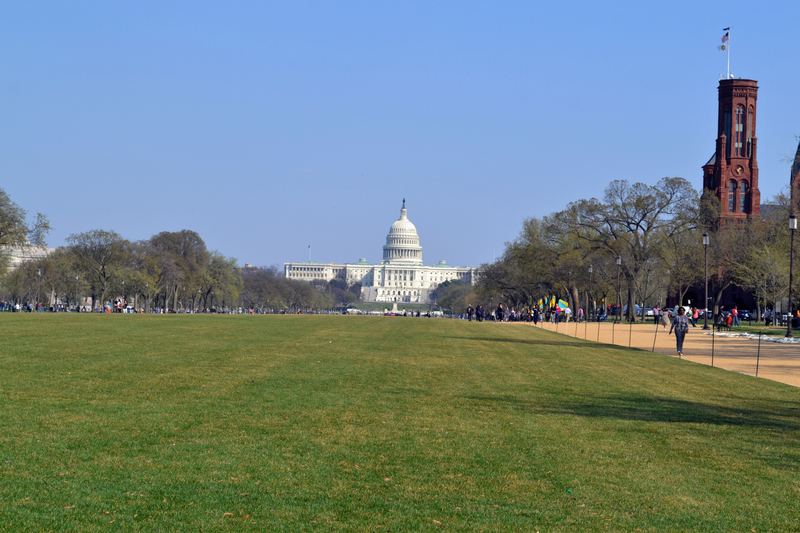 We did get some great photos of the outside as we walked around it to get to the Lincoln Memorial. Here are the two family group shots. 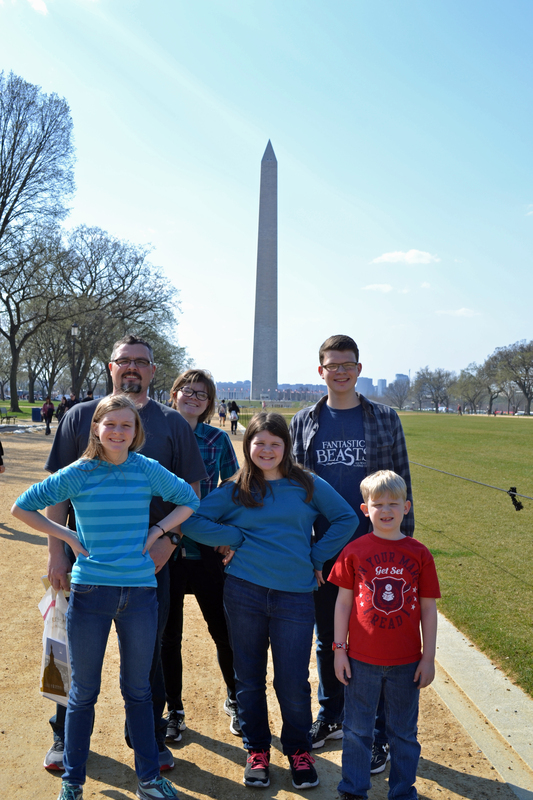 We walked from the Capitol (after seeing the House and Senate chambers) to the Washington Monument. Here is a view of the Capitol from the Washington Monument. I didn’t notice this until I was editing these photos, but there is a difference in the appearance of the monument depending on which side the sun is shining. This photo is the side that was in the shadow. And here is the sunny side! 🙂 Which do you like better? I was surprised to read that the monument is 554 feet tall and is the world’s tallest obelisk, built in honor of George Washington. The work began in 1848 but was halted from 1854 to 1877 due to various reasons, one being the Civil War. You can see a difference in the shading of the marble which shows where the work stopped and then started again using a different type of marble. The finishing touches were complete in 1888 It was exciting to get even this close to it, and I loved how Old Glory encircles it. 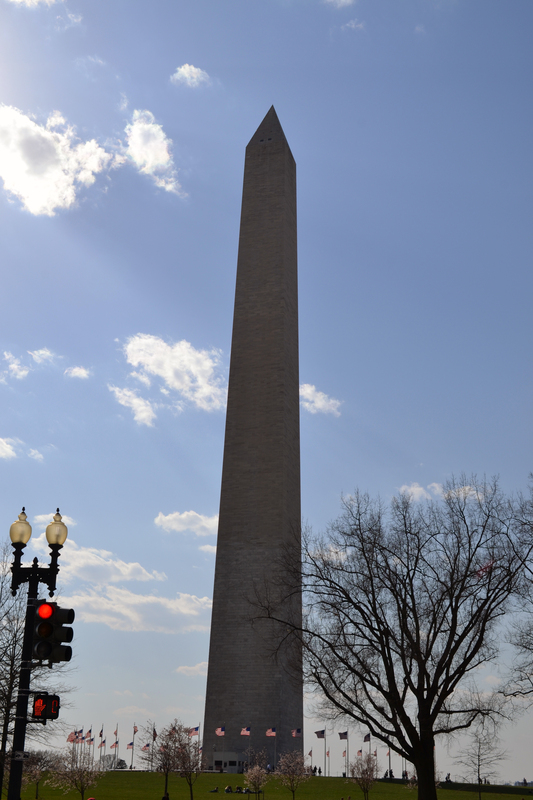 We saw the monument multiple times as we traversed the roads of D.C., and I snapped photos of it many times, too. 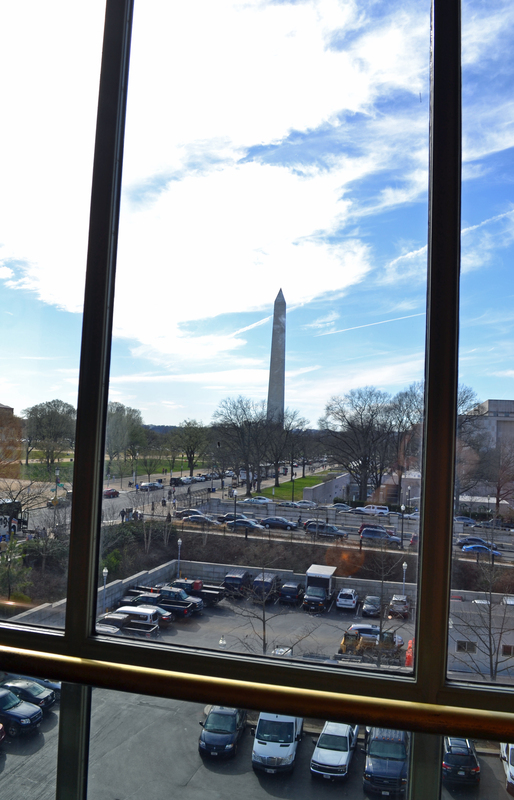 I took this one from the second floor of the Smithsonian Museum of Natural History. The Washington Monument is kinda like the “Old Faithful” of D.C., it seemed to be everywhere! And it made me smile every time I saw it. I vote for the sunny side of the memorial, but it is impressive and beautiful from every angle! Another fun tour! Really enjoyed it and lovely photos too.